Add the apple cider, onions and bratwurst. When the IP beeps after pressure cooking for 8 minutes, allow your IP to naturally release pressure for 5 minutes. While naturally releasing pressure (also known as NPR or NR), the display will reflect numbers counting up from 1. The numbers indicate how many minutes the IP has stopped cooking since it beeped (or how many minutes it has been naturally releasing pressure). No need to touch your IP while it naturally releases pressure. The pin at the top of your IP will drop when all pressure has been released and it's safe to open. Press SAUTE and cook until apple cider reduces. The cider will eventually reduce and thicken to glaze the bratwurst. 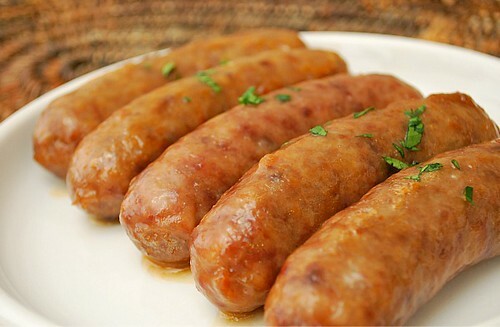 * You can easily double the recipe by cooking 10-12 brats with 2 cups of apple cider and pressure cooking for 10-12 minutes instead of 8.